With its take-me-home face, you can't help but love the hot-doggy Purl Soho Pup! This full-color Pattern includes step-by-step instructions, as well as full-size templates. 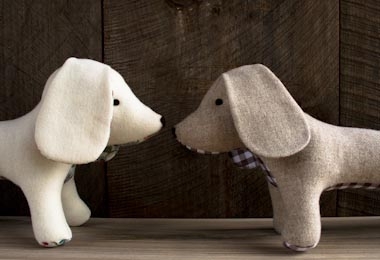 Your finished Pup will measure 17 inches long x 8 1/2 inches high, perfect for a good doggy snuggle! Available as aPDF download, for a list of materials you'll need to make your Purl Soho Pup, please click Product Details, above. A fat quarter of felted wool. We used Dorr Mill's Wool Yardage in Natural or Oatmeal. A fat eighth of woven cotton fabric. We used Kokka's Small Gingham or Liberty of London's Tana Lawn Classic. A 3-inch square of wool felt. We used Wollfilz's 100% Wool Felt in brown.